Zindagi Tv Premium Entertainment Channel which is famous for Broadcasting Pakistani Tv Serials in India.Now Zindagi Tv ready to Launch a New Tv Show in May,2015 with the Name "Sabki Laadli Laraib". This Tv Show is originally a Pakistani Tv Show which is previously broadcasted on Pakistani 'Geo Tv' with the name of "Ladoon Mein Pali". Sabki Laadli Laraib is Produced by A&B Productions House .This Tv Show is directed by Waseem Abbas and Written By Adam Azeen. Beautiful Pakistani Actress Maya Ali is in Lead role. Sabki Laadli Laraib Tv show is all about Love Triangle between two friends .It is too heart touching serial and one of the most popular Tv show of 'Geo tv'. 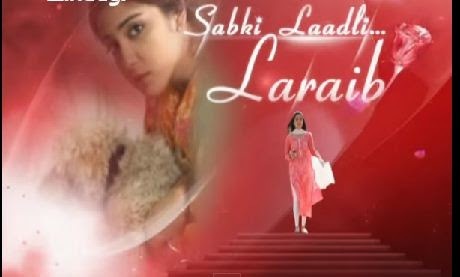 Official Promo/Title song of the Show Sabki Laadli Laraib is released by Zindagi Tv . You can watch it online here or on http://youtube.com.